Nikwax today launched a new and improved version of its Cotton Proof product to waterproof all your cotton clothes and kit. 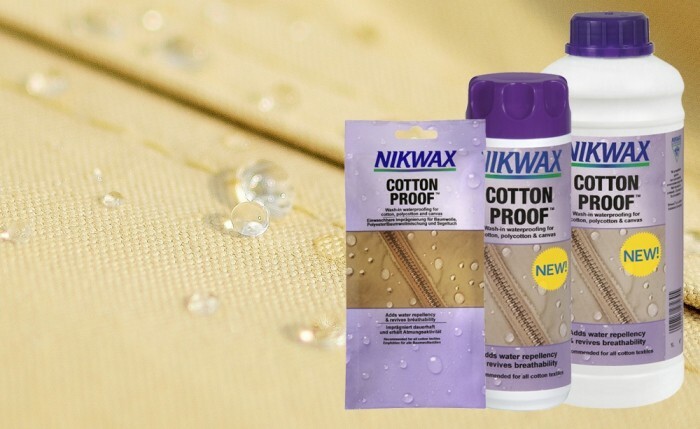 Easy to use in a washing machine at home, Nikwax Cotton Proof will make any cotton fabric water repellent keeping, you warmer and drier when caught out in the rain. Now in a new, improved and three times more concentrated version, users will not only get better performance but also better value for money. The favourite Spring and Autumn walking trousers for walkers and trekkers these days are made of a cotton / synthetic mix. Equally, cotton wind jackets are becoming increasing popular for summer use. When it rains, cotton and cotton-mix fabrics normally absorb a lot of water and become wet, heavy and cold. A simple application of Nikwax Cotton Proof will add Durable Water Repellency, reducing water absorption, speeding up drying time and keeping you a lot more comfortable. Cotton Proof has been specifically designed to treat cotton and polycotton fabrics. It will leave a flexible water repellent treatment on the fabric fibres that allows air to pass through. So your clothes will remain fully breathable, water-repellent and less water-absorbent. As you would expect, Nikwax always puts consumer safety first. Nikwax is the only established aftercare company on the market never to have used fluorocarbons (PFCs) or aerosols. Nikwax Cotton Proof has been developed to the same high safety standards as all Nikwax products.